Metapolitefsi (Μεταπολίτευση) translated as Regime change refers to the period in Greek history after the fall of the Junta in 1974 and it includes the transition period between the fall of the dictatorship and the elections in November 1974 as well as the democratic period immediately after these elections. In September 1973, George Papadopoulos pursuing a liberalization plan for the dictatorship, aiming to legalize the junta government and rehabilitate its image as an international pariah, and feeling confident about his grasp on power after a six year dictatorship career that saw him appoint himself with zeal to every possible high echelon position in the Greek government including Regent, a largely ceremonial post but high on its vanity value, appointed Spiros Markezinis as Prime Minister of Greece, with the task to lead Greece to parliamentary rule that at the same time he undermined by making the powers of the President, a position that of course he held, vastly superior to Parliamentary ones. Spiros Markezinis nevertheless, for reasons still unclear, accepted this flawed task and sensing that power at last was shifting ever so gradually to the politicians from the iron grip of the military demanded that Papadopoulos curtail any military interference that could hinder the process imperfect as it was. Papadopoulos having secured for himself presidential powers approaching dictatorial and wanting to show his largesse not only acquiesced but he also proceeded with a wide range of liberalization measures such as abolishing martial law, easing censorship of the press and freeing political prisoners. Relatively free elections were proclaimed soon after in which political formations including part of the traditional left, but not the communists that were still outlawed, were expected to participate. By reducing the size of the political spectrum of Greece that could freely participate in the elections, Papadopoulos gave an already stilted process another blow so severe that it could normally classify as dead on arrival. The end of the Papadopoulos liberalization experiment: Military tank standing in front of the Athens Polytechneion, providing crowd control junta style. Eventually, this vehicle would crush the gates of the Polytechneion in November 17 1973, putting a violent end to the student uprising and ending hopes of a peaceful democratic transition. Transitions especially those from Dictatorship to Democracy are difficult and fraught with dangers. During the transition there is uncertainty and anxiety. As well there exists a great pent up demand for affirming long dormant civil rights such as demonstrations. The student movement in Greece was particularly hard hit by the dictatorship and student activists were marginalized and suppresed all in the name of communism. Early student activism during the dictatorship included Geology student Kostas Georgakis setting himself ablaze in Genoa, Italy in 1970 as a protest against the junta and served to demonstrate the depth of the resistance and resentment against the regime. Student activism in Greece was traditionally strong and unlike the run of the mill dictatorships where Democracy was a distant dream, it had a long and established record of action in democratic times and, more importantly, it possessed the memory of past democratic action. What better way to affirm the newly re-established political rights and at the same time test their robustness than to start a good old pre-dictatorship type student protest? As well the stiff constraints imposed by the rigid and artificial Papadopoulos transition upon the democratic body politic of Greece antagonized not only the politicians but also the intelligentsia whose primary exponents were the students. Not unexpectedly in November 1973 the Athens Polytechnic uprising broke out starting with the usual student protest tactics such as building occupations, radio broadcasts etc. The student uprising is believed to have been spontaneous, and not orchestrated by any political groups in Greece. In normal (democratic) times such a protest would have been defused using tactics based on usual historical precedents such as negotiations with student leaders and if that failed using normal crowd control methods followed by more negotiations etc. However this student protest happened in the middle of the unprecedented political experiment of transition from dictatorship to democracy. Given that the main engineer of the transition, namely Papadopoulos, didn't have much experience in democratic transitions, in fact he did not have any experience in Democracy of any kind, the rest of the events took a life of their own. Initially the inexperience of the regime in handling civil protest showed in the clumsy way they tried to marginalize and downplay the event. They represented the protests as politically motivated and originating from opponents of the liberalization process. When that did not work they initially did not react in a decisive way and being dictators, even during their liberalization process, (which in itself is some kind of oxymoron), did not think much of negotiating. That inaction gave the student protest momentum and it eventually evolved into a universal demonstration against the dictatorship. 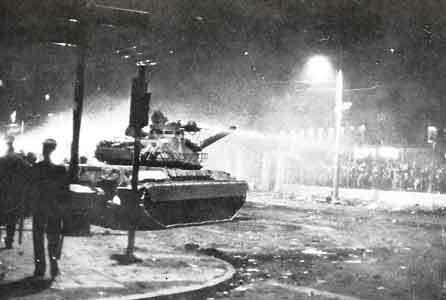 Then the transitional government panicked and since their crowd control method of choice was historically the tank, they sent one crashing through the gates of the Polytechneion. This persistent lack of imagination and flexibility, that betrayed the absence of any real democratic ethos or political intelligence in all of Papadopoulos' actions, sealed the fate of his attempt at political and social engineering in Greece. Ironically, in his autobiographical notes published as a booklet during the dictatorship, Papadopoulos mentions that he attended Polytechneion, the prime Engineering School in the country, but did not graduate. It is no coincidence that his experiment failed at the gates of the prime Engineering School of the country. The scenario surrounding the events around Polytechneion unfolded precisely as hoped for by the dictatorship's more shadowy members such as Ioannidis, long critical of Papadopoulos and his perceived softening up to Democracy and Papadopoulos' pursuit of a more independent foreign policy toward Washington. Being a man of action, but not very careful or introspective, Ioannidis did not wait long. On the 25th of November 1973 using the uprising as a pretext he staged a countercoup that overthrew Papadopoulos, and put an abrupt and dramatic end to Markezinis' attempt for transition to democratic rule. Ioannidis arrested Markezinis and Papadopoulos, cancelled the elections, reinstated martial law and appointed Phaedon Gizikis, an old dictatorship workhorse devoid of any charisma, unable or unwilling to engage in independent thought and faithful follower of Ioannidis' orders, as the new president. Ioannidis liked to work in the shadows and the shadows just became lighter as he put himself squarely in the driver's seat of the Police state, euphemistically called government, hidden only by the faint shadows of his puppets. The new puppet regime pursued an aggressive internal crackdown and an expansionist foreign policy. Internally they moved quickly to stifle any dissent and reinstituted repressive measures such as heavy censorship, expulsions, detentions and torture worse than even the worst days under Papadopoulos. The extent of the suppression was such that even by the already low standards of the Papadopoulos dictatorship this new regime more closely resembled that of a banana republic than its predecessor. Having successfully terrorized the population they then embarked on the Cyprus adventure that only a dictator such as Ioannidis could perceive as foreign policy and since his understanding of political science or even political engineering was rather limited and mainly centred around the term coup d'état he launched one against Archbishop Makarios. However this time it backfired and the Turkish invasion of Cyprus began. Immediately after the Turkish invasion of Cyprus the dictators, not expecting such a disastrous outcome, decided that Ioannidis' approach was catastrophic for the interests of the country. The complete rationale for their subsequent actions, even to this day, is not known. Analysis of their motives can improve with time as new details come to the fore. However indications of panic and indecision were manifestly evident from the reaction of the Greek public as they raided supermarkets fearing an all out war with Turkey and sensing the inability of the junta to govern through its inaction, as well as the anxious attempts of the junta members to communicate with and surrender power to the very same members of the democratic Establishment of Greece that they had demonized and maligned for seven years and they worked so hard to replace with a New Greece (Νέα Ελλάδα) completely devoid of any link with the old party system (παλαιοκομματισμός (palaiokommatismos: Junta term for the old, (pre-junta), democratic party system)) and its politicians. It was as if the brave new world of Ellas Ellinon Christianon (translated as Greece of the Christian Greeks, or to put it in layman's terms: minorities need not apply) envisaged and pursued so fervently by the junta was neither brave nor new and it led straight back to the past. This paradox is at the centre of the phenomenon known as Metapolitefsi. 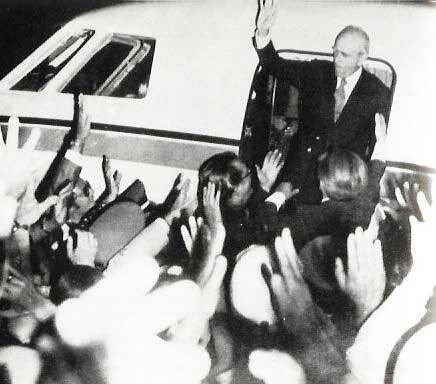 Konstantinos Karamanlis arrives in Athens on the French Presidential jet, courtesy of French President Valéry Giscard d'Estaing, to assume the leadeship of government of national unity that would lead to free elections. He is greeted by a jubilant crowd of supporters craving for the restoration of democratic rule. Greece is the birthplace of the Theatre as well as Democracy. In ancient theatrical plays every time the plot got too tangled for a rational resolution, catharsis (Greek for cleansing i.e. resolution as in cleaning up the mess) came in the form of a god (Deus ex machina (translated from Latin as God from the machine)), that descended from above with the aid of mechanical devices such as levers, cranes and pulleys i.e. from a machine, and dispensed resolution to even the most complex of predicaments. The complexity of the post invasion plot of the Greek political scene in 1974 resembled that of even the most tangled of ancient theatrical plays. It also came with its own Deus ex machina (Greek:Από μηχανής Θεός). The machine this time was more modern, it was a jet and there was no actor but a well trusted and famous politician. The function however was the same: Catharsis. Following the Cyprus invasion by the Turks, the dictators finally abandoned Ioannides and his bankrupt policies. On the 23rd of July 1974, President Phaedon Gizikis called a meeting of old guard politicians, including Panagiotis Kanellopoulos, Spiros Markezinis, Stephanos Stephanopoulos, Evangelos Averoff and others. The agenda was to appoint a national unity government that would lead the country to elections. Although former Prime Minister Panagiotis Kanellopoulos was originally suggested as the head of the new government, since he was the democratically elected Prime Minister originally deposed by the dictatorship and the sentimental favourite, the circumstances had changed and the clock could not be turned back. New circumstances and dangers both inside and outside the country demanded a Prime Minister that would have the clout and force of personality to restore the nascent Democracy to the cradle that originally created it: Greece. Gizikis finally seeing the light and in consultation with the hitherto dormant democratic political elite of the country invited Konstantinos Karamanlis to assume that role.Throughout his stay in France, Karamanlis was a thorn at the side of the junta because he possessed the credibility and popularity they lacked both in Greece and abroad and he also criticized them very often. Karamanlis returned to Athens on a French Presidency Lear Jet made available to him by President Valéry Giscard d'Estaing, a close personal friend, and was sworn-in as Prime Minister under President Phaedon Gizikis who remained temporarily in power for legal continuity reasons. Despite being faced with an inherently unstable and dangerous political situation, which forced him to sleep aboard a yacht watched over by a naval destroyer for several weeks after his return, Karamanlis moved swiftly to defuse the tension between Greece and Turkey, which came on the brink of war over the Cyprus crisis, and begin the process of transition from military rule to a pluralist democracy. 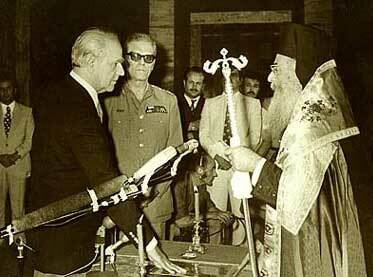 Metapolitefsi day one: Konstantinos Karamanlis taking the oath of office during metapolitefsi under the watchful eyes of Phaedon Gizikis on 24th July 1974 at 4:15 a.m.
During this transition period of the metapolitefsi, Karamanlis legalized the Communist Party of Greece (KKE) that was banned by the junta, cleverly using this political move as an easy differentiator between the stubborn junta rigidity on the matter that smacked of totalitarianism and his own realpolitik approach honed by years of practicing democracy. He also adopted a measured approach to removing collaborators and appointees of the dictatorship from the positions they held in government bureaucracy, and, wanting to officially inaugurate the new democratic era in Greek politics as soon as possible, declared that elections would be held in November 1974, a mere four months after the collapse of the Régime of the Colonels. In those elections, Karamanlis with his newly formed conservative party, not coincidentally named New Democracy (Greek: Νέα Δημοκρατία, transliterated in English as: Nea Demokratia) obtained a massive parliamentary majority and was elected Prime Minister. The elections were soon followed by the 1974 plebiscite on the abolition of the monarchy and the establishment of the Hellenic Republic, the televised 1975 trials of the former dictators (who received death sentences for high treason and mutiny that were later commuted to life incarceration) and the writing of the 1975 constitution.